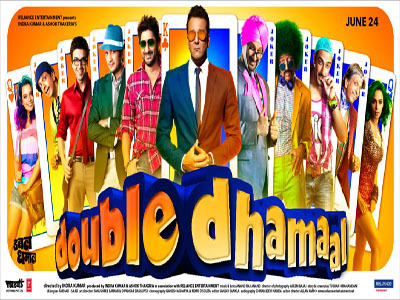 The four good-for-nothing jokers from Dhamaal - Roy (Ritesh Deshmukh), Adi (Arshad Warsi), Manav (Jaaved Jaaferi) and Boman (Aashish Chaudhry) are back again! They are still as stupid and useless as before. Hard work is a strict no-no for them and the only work they have ever done in their lives is to lie down on their backside and dream about a good life where they have ‘everything’ without doing ‘anything’! And then, suddenly they see their old arch enemy – the corrupt Inspector Kabir Nayak (Sanjay Dutt). But he's no longer a cop and instead of chasing crooks, he's chasing money – driving a Mercedes and has a posh office and a lavish villa. The four mad caps go green with envy and decide that come what may, by hook or by crook they will share Kabir's good fortune. And so they blackmail Kabir into making them his business partners. They are in seventh heaven, yippee, all their dreams are coming true. But what they don't know is that soon their dreams are going to turn into nightmares because Kabir has his own hidden agenda, only shared by his sultry wife Kamini (Mallika Sherawat) and lovely sister Kiya (Kangna Ranaut). And so starts a game of one-upmanship, with both sides having tricks up their sleeves and where sundry characters like Batabhai (Satish Kaushik) and King of Casino Johnny Bonzola (Harry Josh), turn up to make their foursome's life miserable. And of course, there's a hell lot of money at stake. So who will have the last laugh? The canny Kabir or our four loveable jokers? ‘Double Dhamaal’ is all about that. Director Indra Kumar succeeded in raising ample laughs in the first part, but this time he does not seem to be in his elements. His direction is lackluster as he fails to handle the comic situations with aplomb, thanks to the story and screenplay writer (Tushar Hirannandani) who does a shoddy job of it. While the interest level in the first half is at least maintained, the second half is a complete mishmash. Dialogues by Farhad-Sajid cater strictly to the gallery and in that sense, they have done a fair job. If the writing and direction fails to impress, even the acting department is not up to the mark. Sanjay Dutt looks disinterested and sleepwalks through his role in certain scenes. Mallia Sherawat sizzles in the ‘Jalebibai’ song; but needs to work on her comic timing. Ditto Kangna Ranaut who needs diction classes pronto. Satish Kaushik is very likeable and brings the house down whenever he arrives on the screen. Talking about the foursome, they all are convincing enough to come across as ‘fools’ and – be it Arshad, Riteish, Ashish or Jaaved, they get equal scope to display their antics; but due to the slapstick humour, their performance comes across as too loud and amateurish at times which actually gets on to your nerves after a point of time. Music by Anand Raj Anand is nothing to rave about except the ‘Jalebibai’ song (well choreographed by Ganesh Acharya) and the remix version of ‘Oye Oye’ from Tridev. Editing by Sanjay Sankla could have been tighter especially post interval. Cinematography by Aseem Bajaj is good and he is able to capture the scenic locations of Macau very well. Action by Allan Amin is functional. Art direction by Tanushree Sarkar is eye-filling while sound design by Chiranjeevi Nanda is more of ‘noise’. To sum it all, watch ‘Double Dhamaal’ strictly for the awesome foursome’s ‘kamaal’ comedy, but beware it’s a complete no-brainer. If you like illogical comedies, you might just like it, otherwise go at your peril!